The Brigantine will no longer be responsible for deconstruction of former waterfront restaurants. SAN DIEGO — One of the longest standing seafood restaurants on the San Diego waterfront will soon be demolished. The question was never if or when the demolition would occur, but instead who would guide the wrecking ball into the collection of restaurants operated by Anthony’s Fish Grotto. Commissioners with the Port of San Diego formally decided, July 11, the regional quasi-judicial agency would oversee the demolition of a building once home to several restaurants on the Downtown San Diego waterfront, including Anthony’s. Demolishing the former restaurant building would facilitate the redevelopment of the Anthony’s location as Portside Pier by The Brigantine. The port district had previously approved a Coastal Development Permit for The Brigantine to demolish the former Anthony’s building. The Brigantine, however, no longer seeks to be the demolishing party; Anthony’s also refused to perform the demolition, according to port district staff. Port district staff stated the demolition is necessary to prevent the vacated building from becoming an attractive public nuisance with constant threats of trespass and disrepair. The building is also beyond restoration or other forms of reuse, port staff added. At least one commissioner believed the port district had to move forward with the demolition of the Anthony’s structure, as it would allow The Brigantine to realize its plans for Portside Pier. Commissioner Dan Malcolm told his colleagues the benefits of this project outweigh its costs. “The benefits to the public of pushing this project forward more than make up for any burden we may have with issuing a [permit],” Malcolm said. The addition of a public dock could go a long way in moving people around the Downtown San Diego waterfront without increasing terrestrial vehicle traffic, Malcolm told his colleagues. 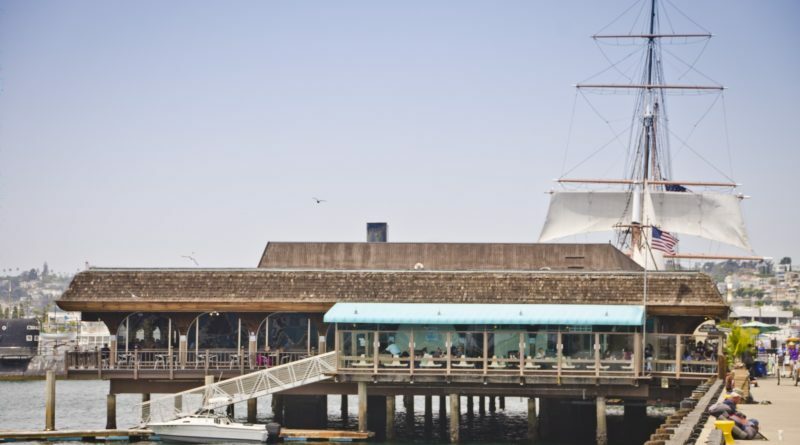 The new Portside Pier proposes to include a Dock and Dine feature, which would be available for berthing to restaurant and non-restaurant patrons, as well as water taxis, during business hours. Demolition would be conducted in at least two phases, with the main building brought down first. The existing 565-square-foot dock might be demolished as part of the demolition’s second phase. Port district staff and the Coastal Commission were initially at odds over the project’s increase in water coverage, additional fill from new piles and the manner in which the Coastal Development Permit could be appealed. Each of the contentious issues, however, was addressed, according to port district staff. Anthony’s had operated three restaurants and a coffee kiosk at the Harbor Drive location for more than 50 years. The restaurant’s 1964 lease with the port district expired in January and was not renewed, with the port district ultimately selecting The Brigantine’s redevelopment project as a replacement. The former Anthony’s building has been vacant since March 15; port district officials fenced off the building shortly thereafter.